I am very definitely a “Girly girl”; I like to be groomed at all times and I live in high heels. My co-ordination is terrible, I am in no way athletic and I never have been. I was the kid in school that couldn’t catch a ball, hated gym class with a passion, and always found a way to weasel out of Cross-Country. I could eat whatever I wanted and maintain a size 8-10. Then I hit 30 and a multitude of meals started to stick. The horror….. I realised I was going to have to start working out! So I joined a Gym and I was a member for several years. Unsurprisingly it was very much a necessary evil. I stuck to it with rigid application but it was so boring. Day after day like a hamster on a wheel. So I tried to alleviate it with music, audio books, watching TV on my i-pad but it was clear I needed a change. My husband (Chris) and I work in the media and Krav Maga was becoming increasingly popular in celebrity circles so it was on our radar. Chris had been an Aikido practitioner for many years and was looking for something new so we investigated training options and found the West Coast website. I was initially apprehensive, I had never done anything like that before but it was a lot easier for me because we joined the Club as a couple and I would definitely recommend coming along with a partner or friend. Equally, if they don’t want to join up with you, stick at it and don’t be deterred. 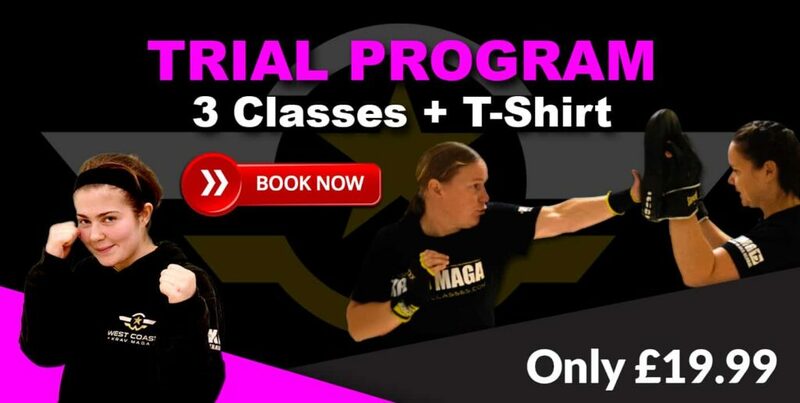 The great thing about Krav Maga is that you don’t have to be Super-strong, athletically gifted, or wonderfully co-ordinated – which is obviously a big plus for me! It is extremely easy to learn and become proficient quite quickly, simply because it builds on your natural reactions to perceived threat. I think training in Krav Maga, or probably any other Martial Art / Fighting System, is a vastly different proposition for a woman. I’m under no illusions that I’ll win a fist fight against a huge guy. However, I now have the element of surprise on my side. The last thing a would-be assailant will expect is to have their attack blocked, whilst simultaneously finding themselves on the receiving end of a good right cross. These are the things that will buy you that all-important opportunity to get away. One of my concerns was that the class may be really “Gung-ho” and fighting mad but it really isn’t that way at all. Lee fosters an environment in which Club members are very considerate of each other and always willing to help each other learn. Lee is an excellent teacher; he is extremely patient and his primary concern is always the safety and well-being of Club members. He is very focused on technique; ensuring that should you need to apply your training in a real situation you won’t injure yourself in the process. Best of all – he lets me wear my lipstick! We’re still negotiating on the heels…. Work permitting Chris and I train twice a week, we are the “Couples Therapy” corner! It’s certainly good fun throwing punches at each other for two hours, learning to defend yourself and getting fitter in the process. The Club cohort is a great bunch and we have social events throughout the year at which partners and children are always welcome.